doctors. After numerous tests including an EKG, bloodwork and an ultrasound, it was discovered he had gallstones. Gallstones are small, pebble-like substances that develop in the gallbladder. The gallbladder contains a liquid made in the liver called bile which helps digest fats. small intestine, where it aids with digestion. Bile contains water, cholesterol, fats, bile salts, proteins, and bilirubin. If the liquid bile contains too much cholesterol, bile salts, or bilirubin, it can harden into gallstones. It can form cholesterol stones which are the most common, and are made from hardened cholesterol, or pigment stones which are small and made from bilirubin. Gallstones can block the normal flow of bile if they move from the gallbladder and lodge in the ducts that carry bile from the liver to the small intestine and cause inflammation in the gallbladder. This can be very painful and dangerous, and can cause severe damage to the liver, gallbladder or pancreas. Since the gallbladder is considered a nonessential organ, doctors will likely recommend you have your gallbladder removed using a procedure called cholecystectomy, which was recommended for my husband. The liver produces enough bile to digest a normal diet. 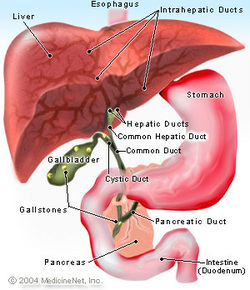 Once the gallbladder is removed, bile flows out of the liver through the hepatic ducts into the common bile duct and directly into the small intestine, instead of being stored in the gallbladder. Because now the bile flows into the small intestine more often, softer and more frequent stools can occur. He also does not tolerate fatty foods and spicy foods too well. These symptoms are temporary and rare. In his opinion, these symptoms are the lesser evil compared to the pain and the severe risks of the alternative of not having surgery.